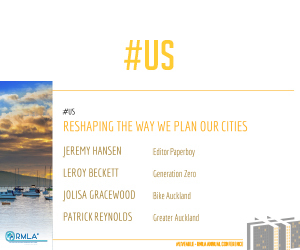 Paperboy editor Jeremy Hansen talks to the leaders of tree of Auckland’s most influential online communities about how a new generation of voices is reshaping the way we plan our cities. Jeremy Hansen Editor, Paperboy. Jeremy started his feature writing career in the mid-1990s at Metro magazine. Now, after stints at RNZ’s Morning Report, as a reporter on TVOne arts show Frontseat and over a decade as the editor of HOME magazine, he’s running Paperboy, a lively free weekly covering Auckland food, style, culture and urbanism. Leroy Beckett Generation Zero. Leroy is Auckland Director of Generation Zero, a youth-led group campaigning for positive climate change action. Leroy has a strong interest in politics, the media, media theory, public transport, cycling, and the environment. Jolisa Gracewood Bike Auckland. Jolisa is communications manager and deputy chair of Bike Auckland, hte non-profit organisation working for a better city for people on bikes. With a background in literary studies, book reviewing, and editing (both fiction and nonfiction and having lived and worked in Tokyo, New York, and various college towns – she is keenly interested in the stories we tell about the places we live. Patrick Reynolds Greater Auckland. Patrick is an Auckland-based writer and photographer specialising in photographing the built environment. Through both photography and writing he seeks to unpack the role that broad decisions especially around transport policy has on urban form, place quality, and quality of life. He is a member of advocacy group Urban Auckland, the Auckland Council Advisory Panel for Art in Public Places, and was recently co-opted as a member of Auckland Transport’s Customer Focus Committee.